Barbara lived across the street from my Mom on Court Avenue. From the day my mom moved in, she was almost an instant member of our extended family. Her two kids were already grown and moved away. Mom used to make extra and take dinner over more days than not and she was just like another grandma in our family. She really enjoyed attending the special family events. Here she is at my baby shower before we traveled to Vietnam to bring Jammer home in 2007. 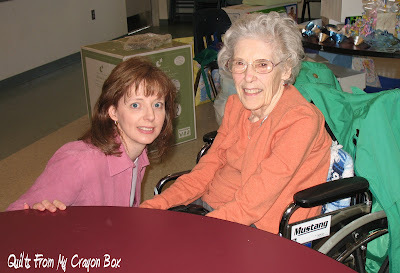 Barbara was born in 1922 and she and her husband bought the house across from Mom in 1950 (mom didn't live there then). She lived in that house the rest of her life. She passed away in the spring of 2009 at the age of 87. Mom helped her kids and grand kids sort through all the accumulation of her life and the 59 years in that house. There was a lot of stuff. Knowing that one day we'd be bringing a baby girl home, they offered to us the dresser that used to be her son's when he was young. This is what it looked like when we acquired it. 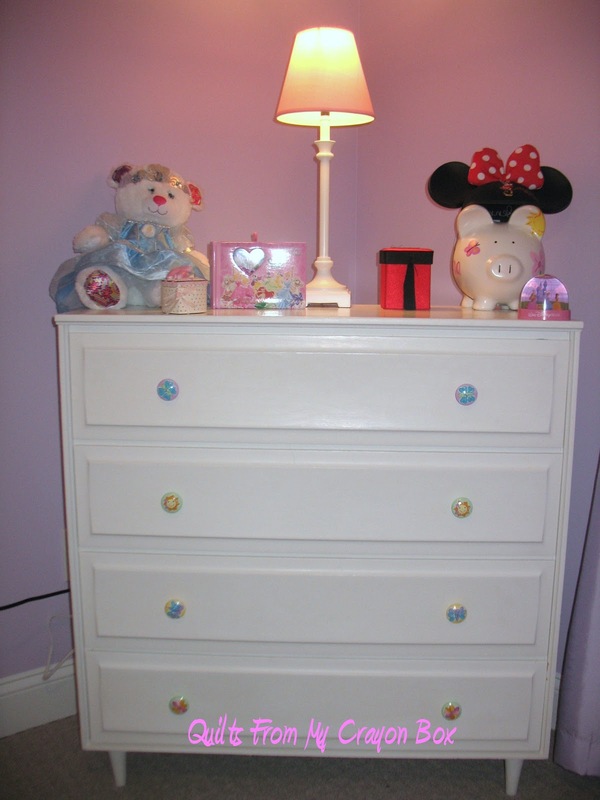 It was painted and the knobs that I purchased that matched her bedding set were added and today it looks like this. I'm sure you are all wondering just why I am telling you all of this. 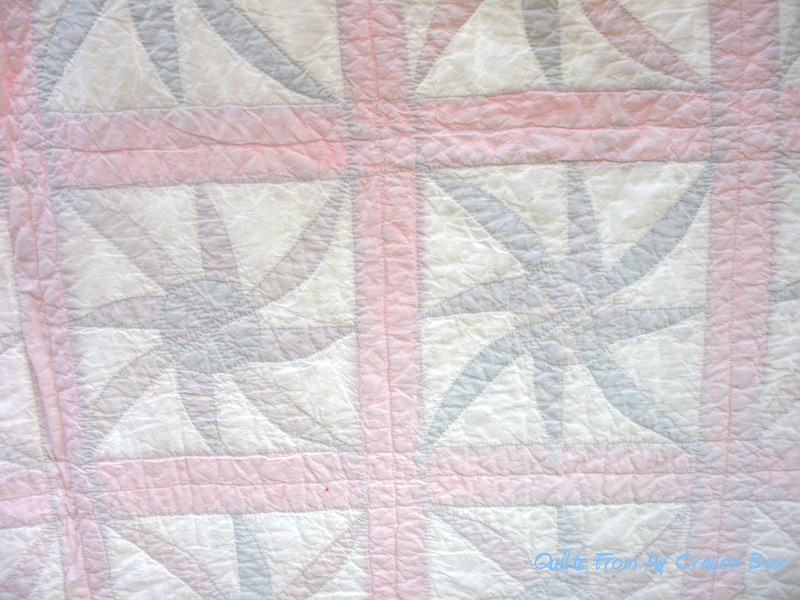 Well when we went to view and pick up the dresser, I saw a couple of great handmade quilts on one of the upstairs beds. I didn't get a chance to get a really good look at them but I knew instantly they were wonderful. I told her family that they were true heirlooms to be kept in the family but if after all is said and done, if no one in her family wanted them that I definitely would. Not everyone would be able to appreciate them and I certainly didn't want them to just be given away to someone that wouldn't understand. I was truly surprised when I got the call that they were mine. Mom picked them up and eventually she brought one to me. Why only one? Well she kept the other quilt for herself! Sneak. Oh well, it too will be mine one day. So here is the one that I have now and want to share with you today. I found the block listed in Jenny Beyer's The Quilter's Album of Patchwork Patterns. It is called Whirling Star and it was published in the Detroit Free Press in February 1936. Mom and I have been trying to date this quilt. 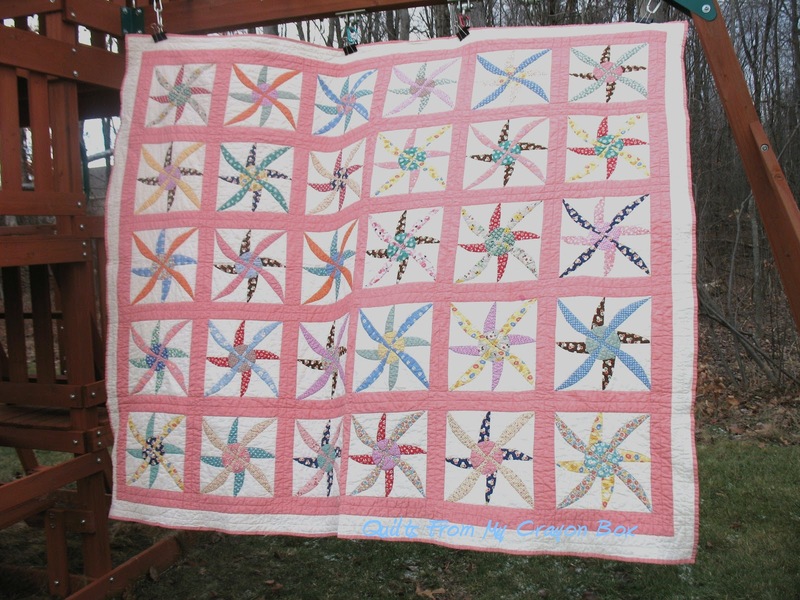 Barbara was just 14 when the pattern was published and while she certainly could have started this quilt then we don't think it is likely. She and her husband did live in the Detroit area in the early years but that is all we know at the moment. I hope to be able to find out more some day from her son or her daughter. Each block was hand pieced from a great collection of 1930s prints and some that look a tad bit older to me. They certainly aren't perfect and that makes it all the more special to me...thinking about her stitching each piece by hand. The background is muslin I believe. 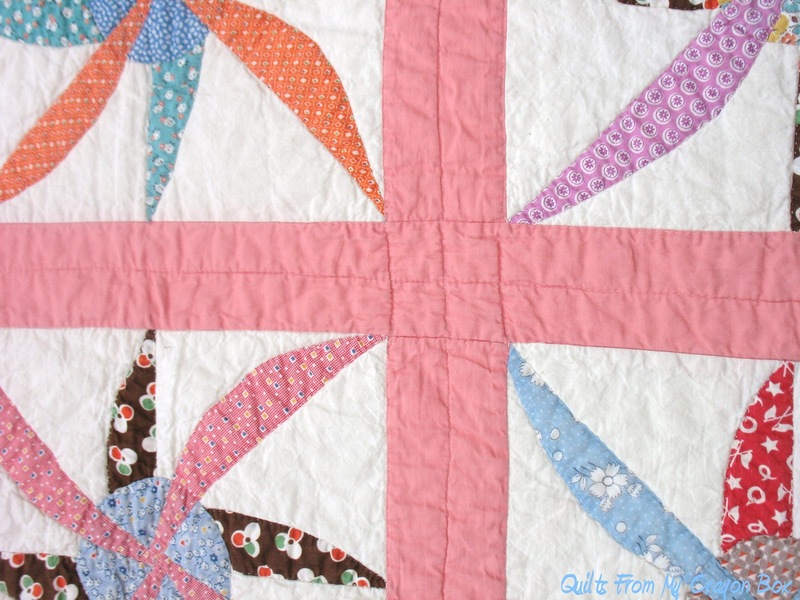 The sashing is actually one strip but her hand quilting makes it look like two strips. 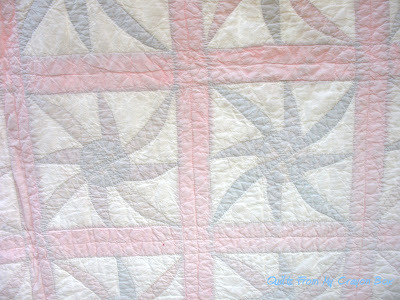 The blocks were all outlined but there isn't any quilting on the backgrounds. Here is a view from the back. 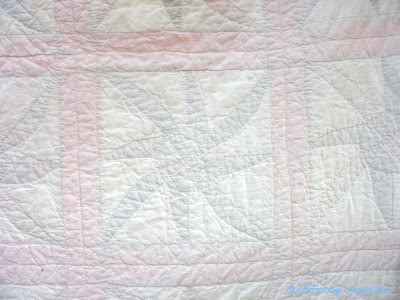 Again muslin was used for the backing and whatever she used for batting is very thin. It is cool the way you can see the shadows of the front blocks through the back. 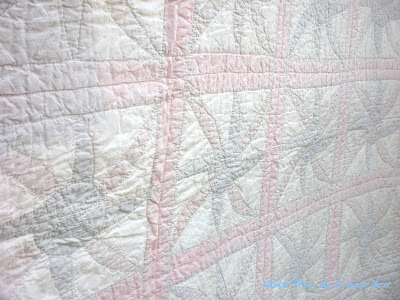 I just love the way the quilting shows on the back and the crinkly from it being washed and loved. 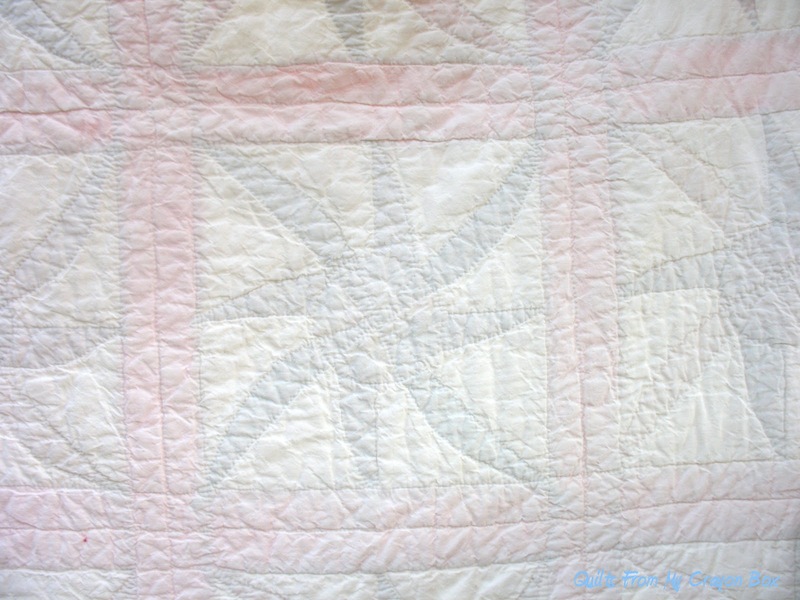 I've been using this quilt on my side of the bed recently during the really downright brutally cold nights we've been having lately. I can't stand to be cold while I sleep and hubs always runs warmer than I do. I blame my thyroid. 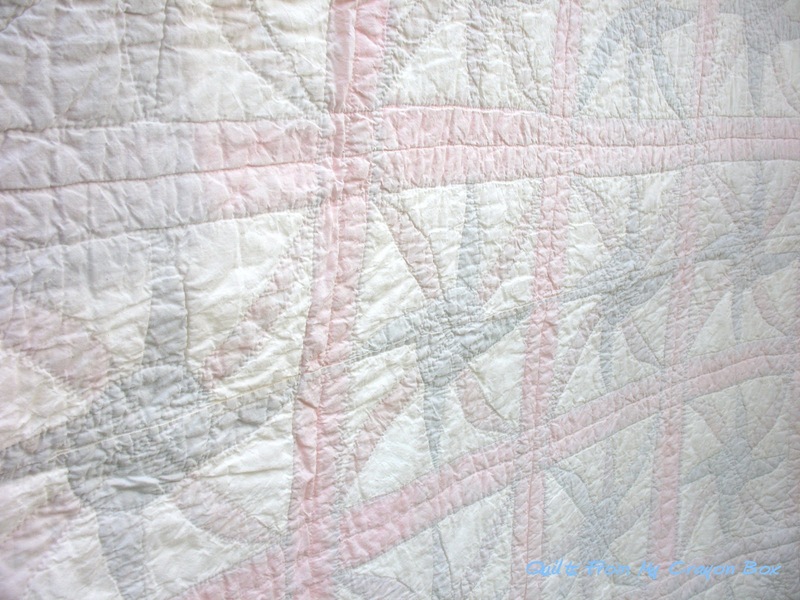 I cherish this antique quilt and all the hours and hours of work that went into it. No matter what the age, it is in perfect condition. Rest assured that it will remain in my family forever, to enjoy as a quilt should be and to always remember a very special lady that I am glad to have known, if only for a while. 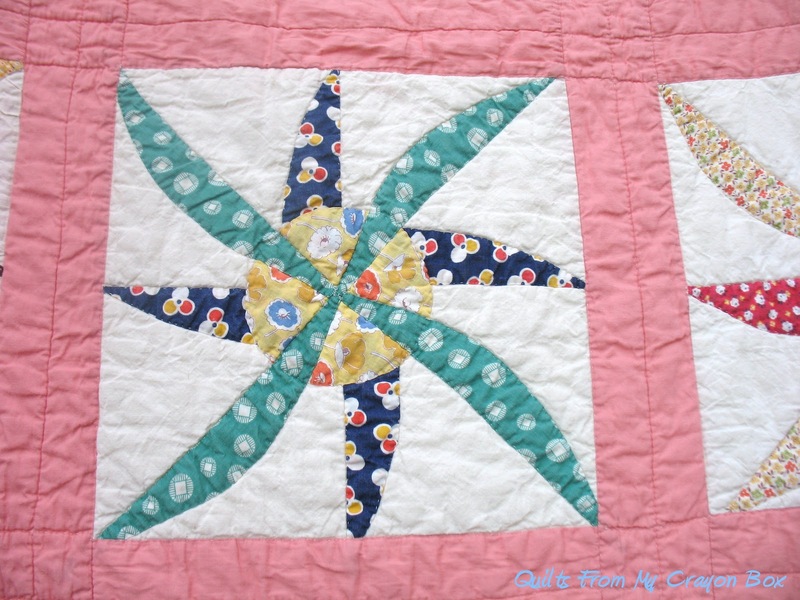 A special quilt and thank you for sharing with us. That is SO awesome!! Not only is it beautiful, but it has a fantastic story. Looking forward to when you know the entire story! I am so glad you ended up with the quilt, it is so special - I love the patterns. It was a simpler time then. What a treasure for you and I am so glad you got it and shared it with us. 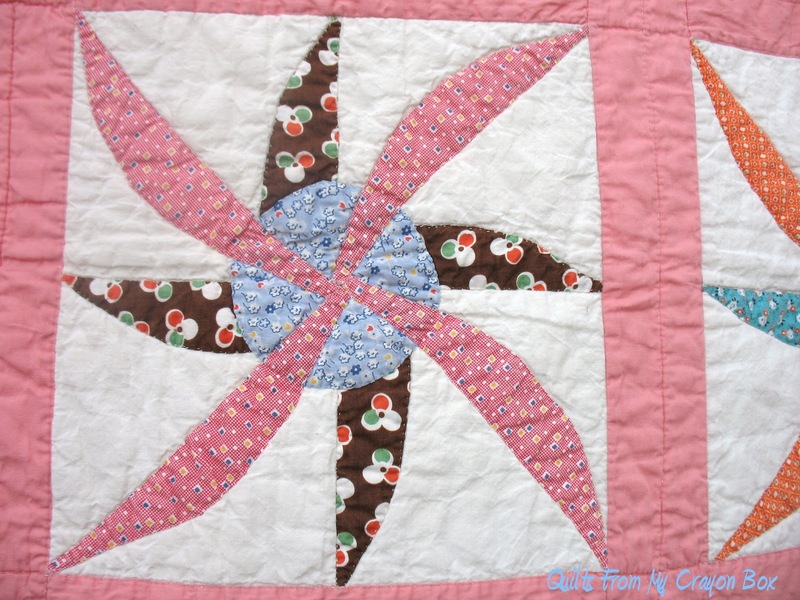 Beaitiful Quilt And Story. Love The Pattern. So GladYou Have Ot To Treasure. 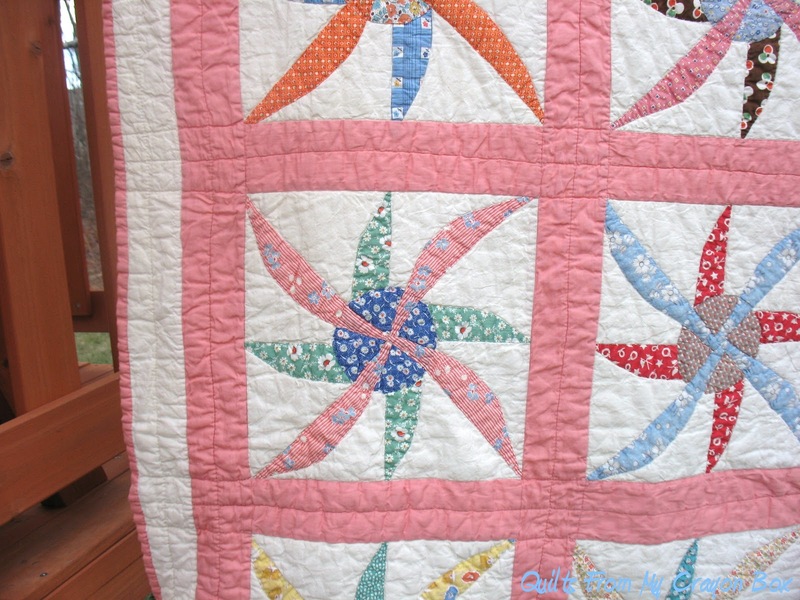 What a fantastic quilt, love the pattern and fabrics...how special! Great quilt..great story. What a treasure. The fabrics are very 1930s/early 1940s, soem match those I see in my family quilts from that time period (my Grandma married in 1935 and there are several quilts she made with my Great Aunt in those first years of marriage within our family. Truly great story. Do you know that she was the person to make them both (did her children know?). Treasure, for sure. 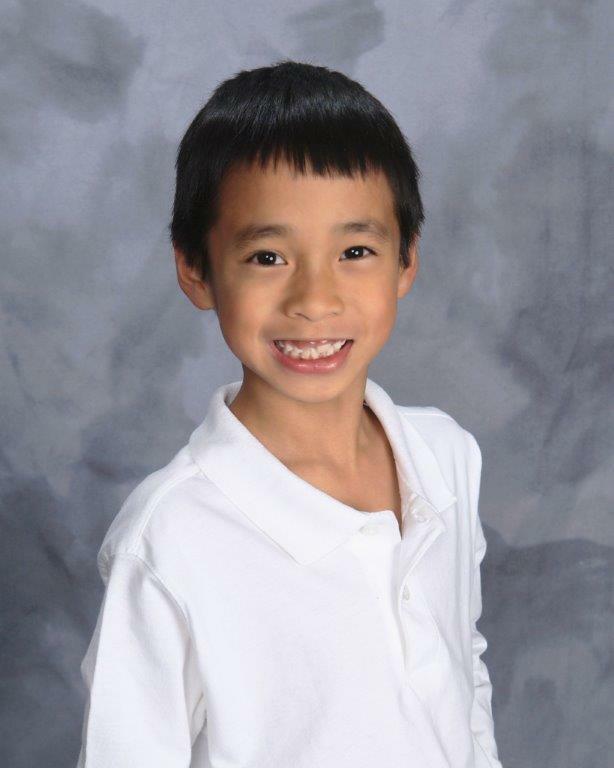 Thank you for sharing such a heartwarming story. 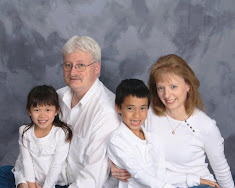 What a blessing for Barb that your mom and family "adopted" her. 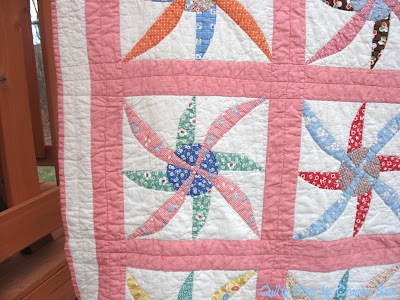 Truly a quilt full of memories to be treasured. What a special quilt I find it hard to understand why no one in her family wanted it but I am so glad you have it to take care of and appreciate the way it should be. 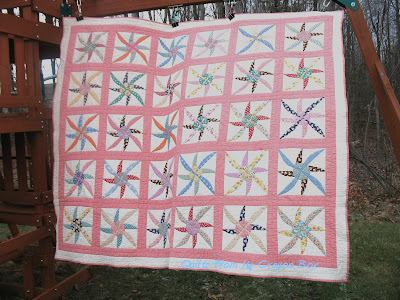 Very special quilt and it sounds like she was a special and loving woman. While I was in college and taking my first quilting class for college credit, my college was the little town next to my grandparent's town. I decided to write my English term research paper about quilts. I visited my grandparents and grandma showed me all the church bazaar quilts she bought from her friends, and several quilt tops she had completed but needed to be finished. She promised them to me. A few years later, my aunts moved my grandparents closer to them to take care of them, and emptied the house (my grandmother had a house full of stuff). 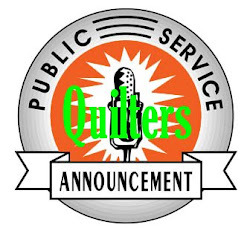 Lots of special stuff disappeared, including the quilts and quilt tops. I was so disappointed. I'm glad you have something to treasure from this special lady. 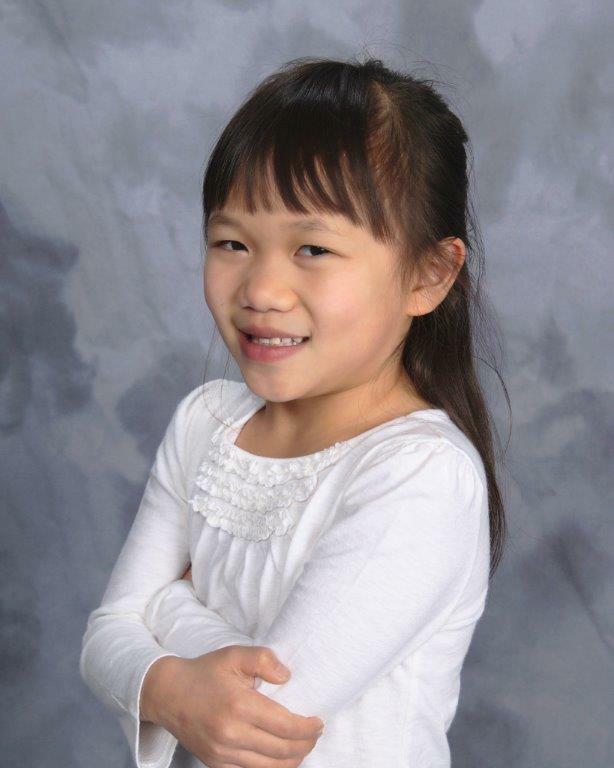 MIchelle I'm so glad you rejuvinayted this wonderful story this week at TUesday ARchives. 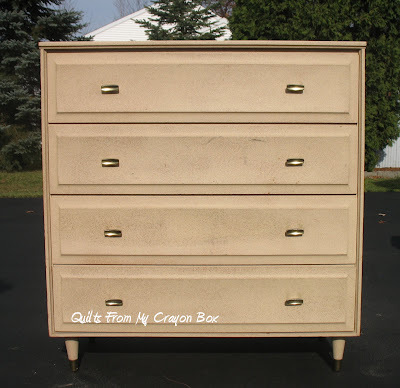 I am so sentimental like this....about the dresser and quilt!